Upstate generally fared well in the rankings. Syracuse was #28 (!) (tagged as "up and coming"), Albany #30, Buffalo #33, and Rochester #39. The top five nationally, from #1: Austin, Denver, San Jose, DC, and Fayetteville, Arkansas. As much as I love this and say "Yay Albany" I simply cannot accept that Syracuse ranks higher (even by a small margin) than Albany. Their metric must be flawed. Have they BEEN to Syracuse?! "Albany can be a transient region, with the working population shifting every time a new governor takes office." Well, that is just silly. Whoever wrote that doesn't have a clue about the massive civil service system that is the permanent underpinning of state government, not the far fewer political appointments that would change with each new governor. "By the way: Here's a side-by-side comparison of Austin and Albany in the US News Best Places individual categories..."
A problem with the comparison is it fails to account for the negatives of living in a politically-regressive state like Texas. Rebecca, I couldn't agree more. Generally, place rankings are fundamentally flawed but the idea that the parking lot that comprises nearly the entire city of Syracuse is a better place to live than Albany is something I just can't wrap my head around. Speaking as someone who was born and raised in Albany for the first 35 years of my life and having moved to Austin last May, I have a pretty intimate knowledge of both cities. 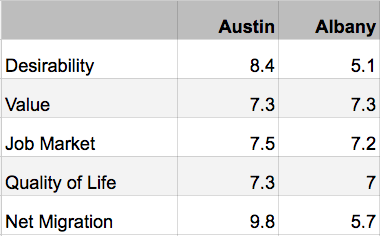 I think they got Desirability ratings right and maybe overrated Austin for value a bit. However, for job market and quality of life Austin blows Albany out of the water. Austin is probably what Albany should aspire to be in terms of jobs, using the University system as an incubator. The problem is the weather, the lack of interesting attractions, and the taxes, none of which will be fixed anytime soon in Albany. To be fair, the governor did move many of the state workforce back to the Empire State Plaza and Albany from other places in the region, thus shifting the working population. Not to bad mouth Albany because it's an ok place to live(though with the right mindset and policy could be an incredible place to live) but I could probably think of 300 places better right off the top of my head....ditto Syracuse! Are these the same dopes that tell me ever year how great the hypercorinated foul metallic tasting Albany water is number one??? BLuv, please keep in mind that your take is highly subjective. Especially regarding the weather, I would rather die in a fire than live in Austin, because the discomfort would last for a much shorter time. That said, I agree the comparison is a strange one at best, and Albany is far better than most state capitals. I lived in Albany (college and grad school and working) and now Syracuse, about 10 years each now. They are both such different cities. Albany is a bit more white collar, more people from NYC because of state government. Syracuse is larger and more fun, in my opinion. Syracuse has INCREDIBLE schools (FM, CBA, West Genesee, etc.) and having SU right in town is great for the community. Albany does have advantages; closer to NYC and Boston and Montreal and a lot of the ski mountains in NYS. But overall, Syracuse just feels more like home. Definitely less transient than Albany. I feel that many people live in Albany for 5-10 years and then leave. 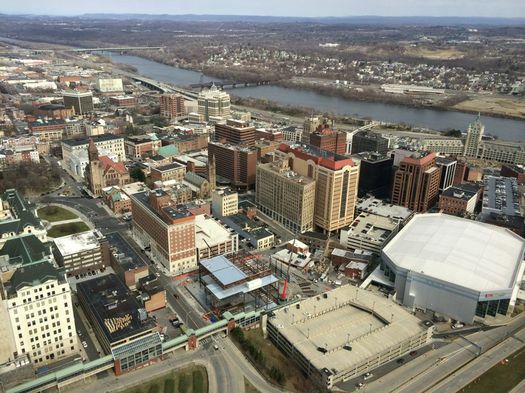 Many live in Syracuse for much longer; settling down and raising a family. These rating systems are so ridiculous. Most people don't realize (although you do mention it in the piece) that they're rating entire metropolitan areas, not cities... so it's really not about the City of Albany or the City of Syracuse. Our region includes Albany, Schenectady, Troy, Saratoga Springs, and many places in between. And San Jose in the top 5?! Maybe if you're making $1 million a year, since that's what you'll need to afford a home there. Oh, and you may want a private plane, too - the traffic out there is terrible!